Before diving full force into the remaining combiner figures in the Combiner Wars line we’ve got this Leader Class Ultra Magnus to take a look at! Always second in command and never Commander, Ultra Magnus makes his presence known on the shelves alongside Leader Megatrons of various flavors. 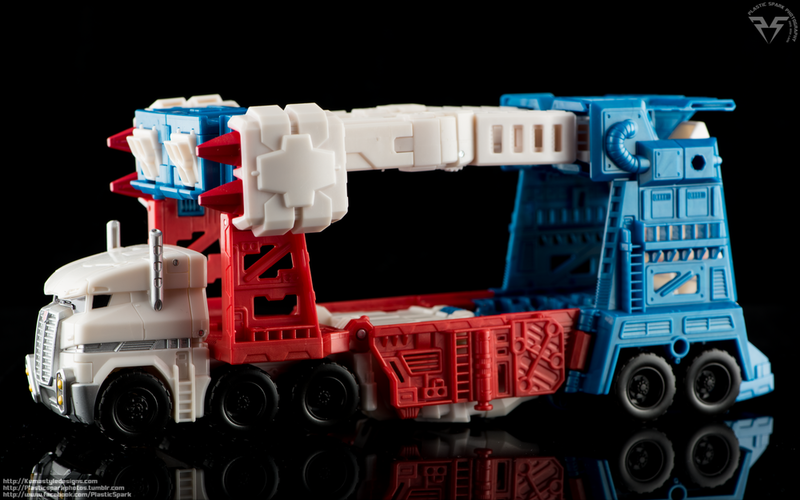 Ultra Magnus is sporting his classic, and rarely modified vehicle mode of a 2 layer car carrier trailer and tractor truck. His mostly white cab is accented with a crisp silver grill (with the tiniest of Autobot logos), Silver smoke stacks and painted headlights. He’s got blacked out windows and in a strangely characteristic design choice the entire front of the cab looks like a really grumpy old man. Seems fitting if you read the IDW comics and are familiar with this version of Ultra Magnus. The cabs connection to the trailer is spring loaded and you can extend the cab forward to allow for a 90 degree turning radius, or scrunch the cab back in for a more compact, all in one look. Magnus has a lot of sculpted detail on almost every inch of him in vehicle mode and would certainly have benefited from a more predominant paint budget. Nothing a little dry brushing couldn’t fix but it is a bit disappointing for the less artistically inclined. At the very least the inclusion of grey or silver rims would have been a real cherry on top. Magnus can fit a standard deluxe figure on the main level of the carrier and another on the top level or 2 legends on each. 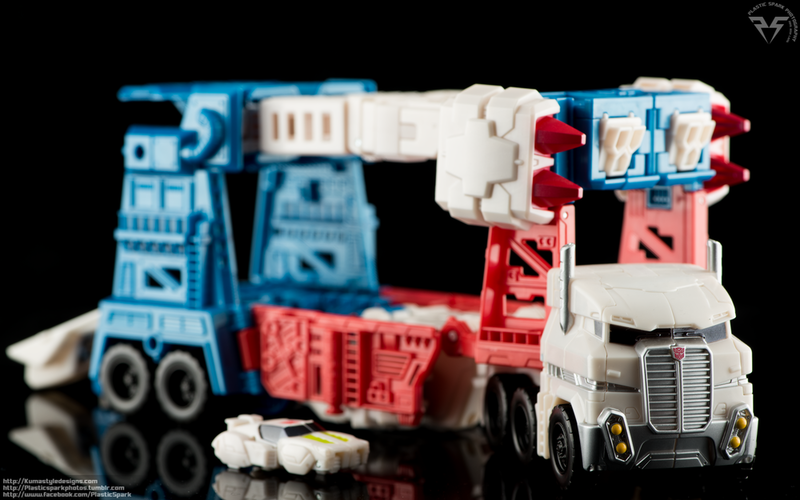 His top level can hinge down to make for makeshift ramps to the second level, though there is a large gap just like almost every other version of Ultra Magnus ever made. The white panels at the rear fold down as ramps as well. Magnus has a couple 5mm pegs on the rear of his vehicle mode for weapon storage but unfortunately there really isn’t any discreet storage for his rifle and blaster/hammer handle. Minimus is a fairly basic little hover car of sorts. Mostly white with a black windshield and some green vented detail on the hood and a red Autobot insignia on his roof. There really isn’t too much to talk about his alt mode, he’s a tiny little white car the size of about 2 Chiclets back to back. Sadly there is no real dedicated storage for Minimus in alt mode. I just rest him on the red portion at the front of the trailer. Let’s switch things up and start with Minimus on this one. Minimus unfolds with a couple very simple but clever tricks and turns into a small white robot with a bit more green on him than his alt mode. His face is nicely painted especially for how small he is (still no excuse for those unpainted faces on the MP human figures HASTAK) with bright red eyes and even the small moustache he’s known for in the More than Meets the Eye comic books. He has basic posability, ball joint shoulders, ball joint hips and hinge knees. He’s made to clip in to the cockpit of the Ultra Magnus armor and sits in there with little foot pedals and joysticks for him to hold on to. The whole process is fun and feels solid… kind of like a budget version of the Armauraders Belerophon cockpit without so many bells and whistles. Magnus in bot mode is an intimidating site to behold. Standing at a remarkable height above pretty much every other generations figure I own he’s massive and powerful looking. His huge shoulder pylons and missile launchers are simple yet effective at conveying the raw strength a bot like Magnus wields. His bot mode is a little less detailed than the alt mode, with a lot of the panels from alt mod tucking into various places on him such as his legs or forming the main components of his chest. That being said he could still use a bit of detail work here and there. His chest cockpit for Minimus is full of details, screens and keyboards and switches that would absolutely benefit from someone spending their time detailing or even just giving them a simple black wash to bring out some of the sculpted details. Now not everything is sunshine and lollipops with this guy. He’s got some pretty glaring issues that make him a bit more of a “Display” rather than “Play” toy. His feet and legs are very hollow and unfortunately he doesn’t have any sort of ankle rocker to level out wider stances. He can be a bit top heavy and doing something to help add some weight to the legs and feet would probably be a worthwhile investment. His hands have hinge allowing for a finger curl similar to Masterpiece figures, however his gun has no locking tab or peg and he can barely hold it without it falling out of his hands. I swear just breathing around it is enough to knock it to the floor let alone playing with him. His hammer is a bit more secure in his hand due to a support groove cut into the larger blue gauntlet armour but still will wiggle loose and fall from his grip. Without any wrist swivels he is not able to pull off much of a pose with his hammer either. If I want to nitpick his shoulder launchers are hollow and look a bit flat from certain angles, and his head can’t look up or down it can only go side to side due to the transformation hinge. Those aren’t make or break issues in my opinion but it is something you should be aware of. There is an upgrade kit (possibly a few by the time of posting this) coming out for this guy. The X2Toys kit I saw has replacement forearms and hands, new feet with ankle rockers, a new gun, a new head with multiple faceplates and some fill in pieces for a few of his more hollow bits. It looks to be a decent investment and I will probably be purchasing it to complete my Leader Ultra Magnus as it seeks to resolve pretty much every issue I have with the figure. I would love to see the kit expanded to include new launchers as well but that might just be me being greedy. You can use the Fansproject or G1 launchers on this guy as well as many fans prefer the look of those. Magnus comes with a small handful of accessories. He has a rifle that looks pretty similar to his trademark G1 firearm. A secondary blaster that looks absolutely ridiculous as a gun and is very clearly designed to be the hammer handle more so than a blaster. He has his twin shoulder mounted rocket launchers that can double as the ends of the hammer and of course, if you count him as an accessory, he also comes with Minimus Ambus. Accessory storage is a bit weak as he really only has 2, 5mm ports on the rear of the vehicle (on his calves in bot mode) and the 2, 5mm ports on his shoulders that most times are dedicated to his rocket launchers. Between that and his inability to hold his own gun… most of his accessories tend to sit on the shelf for now. While I may have come across a little harsh on his flaws, I still think this IDW style Leader Class Ultra Magnus is worth a pickup. 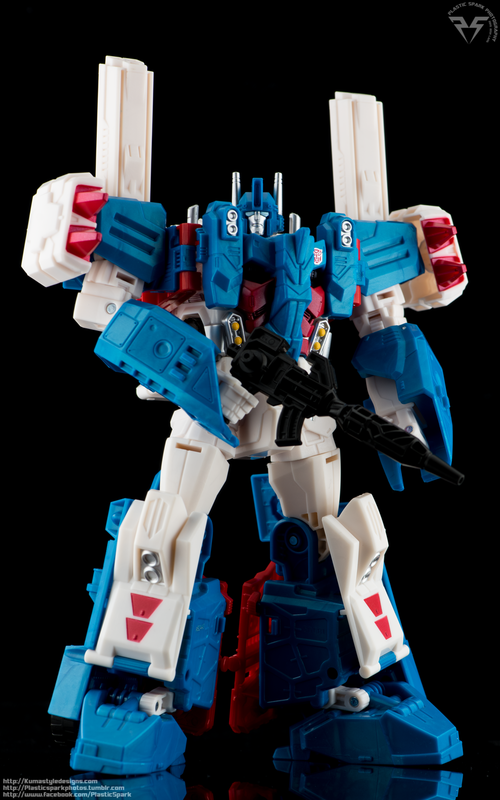 He’s one of very few mainline renditions of Ultra Magnus in his classic G1 style (with modern IDW updates) and boasts an all in one transformation. 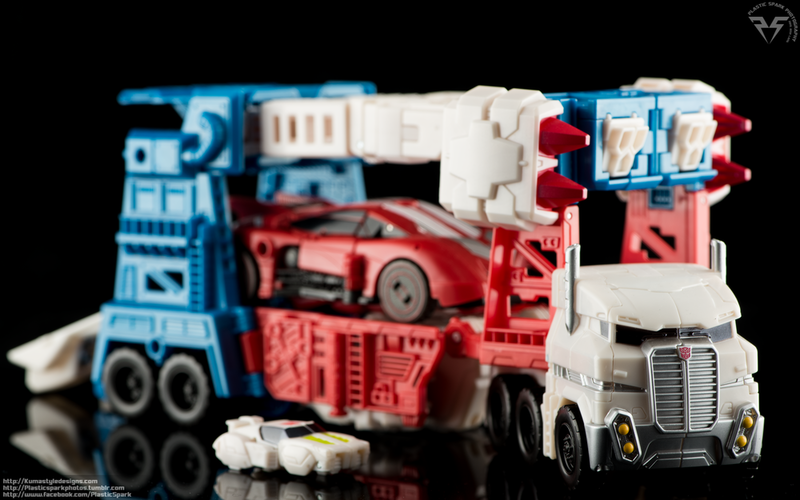 Of course some prefer the idea of a white convoy figure that upgrades using trailer armor, and I honestly really love that idea myself, I still think this works and you still have the fun of a smaller bot wearing the Magnus armor. In terms of comic book likeness he’s not bang on but a healthy mix of IDW and G1 style that will find him at home on a classics shelf, or an IDW shelf without really feeling out of place. He’s taller than the Fansproject City Commander armor and in my opinion has a much cleaner aesthetic to him as well. If you don’t have a classics Magnus and want one for your shelf, don’t let this guy slip by you! He’s a great figure despite his flaws but I wouldn’t want to pay aftermarket prices for him in a year or two. 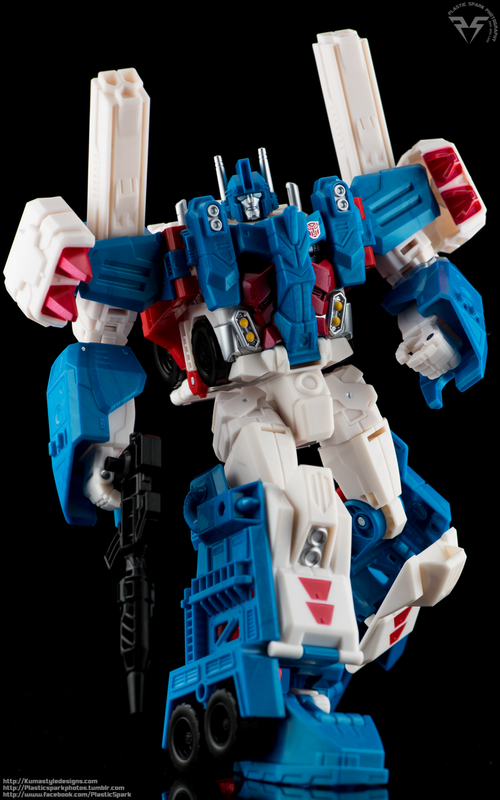 My thought is that with the addition of the upcoming upgrade kit for him, assuming it resolves the flaws it intends to, he will be the definitive Ultra Magnus for Classics and IDW collectors alike. Even without any upgrades he is still a worthwhile pickup. Check out the gallery and see what you think for yourself!